Narrowing down your dream retirement destination—choosing one place over another—can be the most difficult part of starting your overseas adventure. Many places may share a lot of similar attributes; many may appear downright identical. But if you look close enough you’ll discover that they may not be so alike after all. In the end it’s the little things that will make all the difference to your overall happiness. As always, we recommend that you visit somewhere before you decide to put down roots…but this infographic could help point you in the right direction. 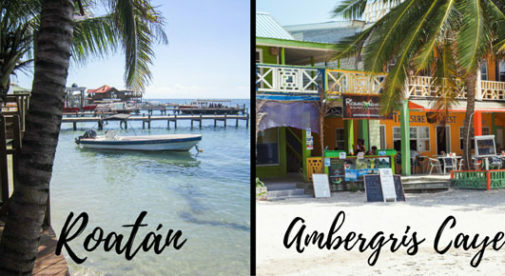 Two of our favorite Caribbean retirement havens, Ambergris Caye (the largest island off the coast of Belize) and Roatán (which lies off the coast of Honduras), go head-to-head in key topics such as cost of living, property, healthcare and more. Population: Roatán has 80,000 residents and multiple villages and towns. Expats live mainly in the villages of West Bay, West End, Sandy Bay, French Harbour, and in the East End area. Ambergris Caye has nearly 20,000 residents. San Pedro Town is the one and only town. Cost of Living: An expat couple who rent can live comfortably on $2,000 to $2,500 per month on Roatán. On Ambergris, most expat couples will need to spend $3,000 per month for a comparable lifestyle, including rent. Language: English is the primary language on both islands. Renting: A decent two-bedroom rental on Roatán can be found for $600 to $1,000 per month. On Ambergris most two-bedroom rentals will start at $900 per month, but will typically cost more. Real Estate: In 2013 and 2014 Ambergris Caye was voted the #1 island in the world by Trip Advisor members, resulting in increased tourism and real estate attention. Two-bedroom condos with a water view can be found priced below $300,000, but the newer condos in more desirable locations will cost more. On Roatán you’ll find plenty of two-bedroom, two-bath condos and houses in good locations for $250,000 or less. Geography: Roatán is 48 miles long, mountainous, and geographically diverse, while 25-mile-long Ambergris Caye is mostly flat. On Roatán you’ll find expansive ocean views from many of the properties on the hills. On Ambergris Caye, if you live off the water you are unlikely to have a sea view. Healthcare: Roatán has two 24/7 hospitals. Ambergris Caye has one public clinic, but no 24/7 hospitals. Expats who suffer a serious health problem must fly to Belize City for care. Transport: Expats who live on Roatán need a car to drive to other towns, such as Coxen Hole, to shop. On Ambergris expats generally own a golf cart or bicycle so their gas bill seldom exceeds $50 per month.